The Clay Research Awards, presented annually at the Clay Research Conference, celebrate the outstanding achievements of the world's most gifted mathematicians. 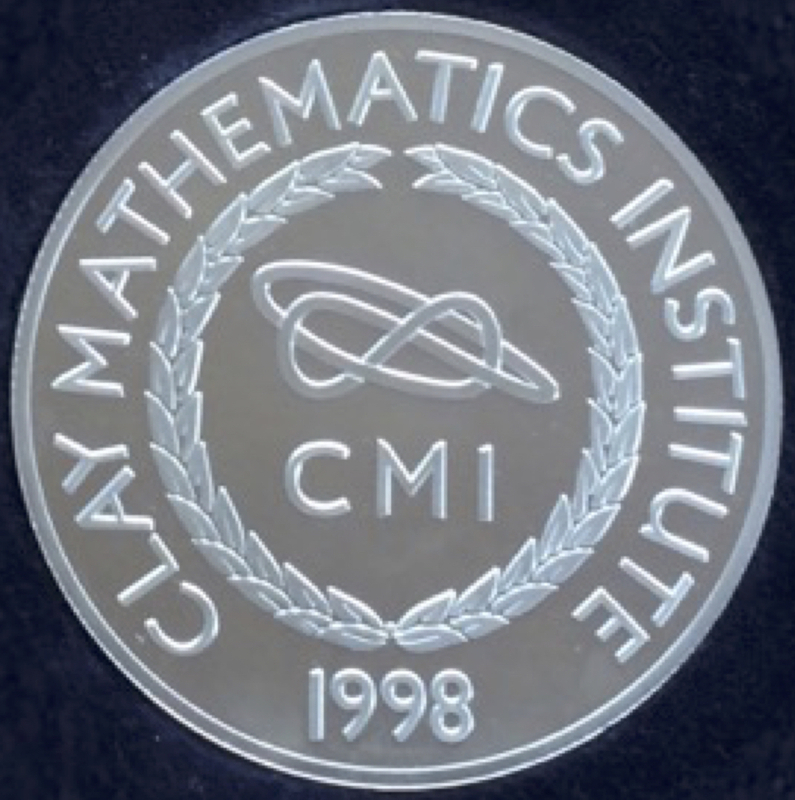 Although perhaps less well known outside the mathematical world than the Clay Millennium Prize Problems, the Clay Research Award is widely appreciated within it. The 2016 Clay Research Award to Mark Gross and Bernd Siebert is made in recognition of their groundbreaking contributions to the understanding of mirror symmetry, in joint work generally known as the ‘Gross-Siebert Program’. It has its origins in surprising predictions of non-perturbative dualities in string theory: that the properties of certain interesting geometries, notably Calabi-Yau manifolds, are reflected in counter-intuitive ways in partner geometries (‘mirror manifolds’). The 2016 Clay Research Award to Geordie Williamson is made in recognition of his groundbreaking work in representation theory and related fields. For their solution of the Erdős distance problem and for other joint and separate contributions to combinatorial incidence geometry. Their work is an important contribution to the understanding of the interplay between combinatorics and geometry. For her many and significant contributions to geometry and ergodic theory, in particular to the proof of an analogue of Ratner's theorem on unipotent flows for moduli of flat surfaces. For his many and significant contributions to arithmetic algebraic geometry, particularly in the development and applications of the theory of perfectoid spaces. For his recent outstanding work in enumerative geometry, specifically for his proof in a large class of cases of the MNOP conjecture that he formulated with Maulik, Okounkov and Nekrasov. For their work in hyperbolic geometry: (1) their proof that a closed hyperbolic three manifold has an essential immersed hyperbolic Riemann surface, i.e., the map on fundamental groups is injective; (2) their solution of the Ehrenpreis conjecture: that given any two compact hyperbolic Riemann surfaces, there are finite covers of the two surfaces which are arbitrarily close in the Teichmüller metric. For their spectacular work on stationary measures and orbit closures for actions of non-abelian groups on homogeneous spaces. This work is a major breakthrough in homogeneous dynamics and related areas of mathematics. In particular, Benoist and Quint proved the following conjecture of Furstenberg. Let H be a Zariski dense semisimple subgroup of a Lie group which acts by left translations on the quotient of G by a discrete subgroup with finite covolume. Consider a probability measure m on H whose support generates H. Then any m-stationary probability measure for such an action is H-invariant. For his resolution of the André-Oort Conjecture in the case of products of modular curves. This work gives the first unconditional proof of fundamental cases of these general conjectures beyond the original theorem of André concerning the product of two such curves. The foundational techniques that Pila developed to achieve this breakthrough range from results in real analytic geometry, which give sharp upper bounds for the number of rational points of bounded height on certain analytic sets, to the use of O-minimal structures in mathematical logic. No Clay Research Awards were given this year. Instead a celebration was held to award the Millennium Prize for the resolution of the Poincaré conjecture. For his work in p-adic harmonic analysis, particularly his contributions to the transfer conjecture and the fundamental lemma. This work, combined with that of others, makes it possible finally to resolve important, long-standing parts of the Langlands program. For their solutions of the Marden Tameness Conjecture, and, by implication through the work of Thurston and Canary, of the Ahlfors Measure Conjecture. The Langlands program is a collection of conjectures and theorems that unify the theory of automorphic forms, relating it intimately to the main stream of number theory, with close relations to harmonic analysis on algebraic groups as well as arithmetic algebraic geometry. Since its origins in the winter of 1966-67, when it was laid out in a letter from Langlands to André Weil, it has served as the basis of much deep work, including applications to many famous problems in number theory, e.g., Artin's conjectures on L-functions, Fermat's Last Theorem, and the behaviour of Hasse-Weil zeta functions. The tameness conjecture asserts that a hyperbolic 3-manifold with finitely-generated fundamental group is homeomorphic to the interior of a compact 3-manifold (possibly with boundary). The Ahlfors conjecture asserts that the limit set of a finitely generated Kleinian group (i.e. the minimal invariant set on the Riemann sphere, which is the boundary at infinity of hyperbolic 3-space) has either full or zero measure, and in the former case the action of the group on it is ergodic. For his proof of the Weinstein conjecture in dimension three. The Weinstein conjecture is a conjecture about the existence of closed orbits for the Reeb vector field on a contact manifold. A contact manifold is an odd-dimensional manifold with a one-form A such that A wedged with the n-th exterior power of dA is everywhere nonzero. In particular, the kernel of A is a maximally nonintegrable field of hyperplanes in the tangent bundle. The Reeb vector field generates the kernel of dA and pairs to one with A. Alan Weinstein asked some thirty years ago whether this vector field must, in all cases, have a closed orbit. (The unit sphere in complex n-space with A the annihilator of the maximal complex subspace of the real tangent space is an example of a contact manifold and contact 1-form. In this case, the orbits of the Reeb vector field generate the circle action whose quotient gives the associated complex projective space.) Note, by contrast, that there exist non-contact vector fields, even on the 3-sphere, with no closed orbits. These are the counter-examples (due to Schweitzer, Harrison and Kuperberg) to the Seifert conjecture. Hofer affirmed the Weinstein conjecture in many 3-dimensional cases, for example the three-sphere and contact structures on any 3 dimensional, reducible manifold. Taubes' affirmative solution of the Weinstein conjecture for any 3-dimensional contact manifold is based on a novel application of the Seiberg-Witten equations to the problem. For her disproof of the Kodaira conjecture. The Kodaira conjecture was formulated in 1960, when Kunihiko Kodaira showed that any compact complex Kaehler surface can be deformed to a projective algebraic surface. For the proof, Kodaira used his classification theorem for complex surfaces. The conjecture asks whether Kaehler manifolds of higher dimension can be deformed to a projective algebraic manifold. Voisin constructs counterexamples: in each dimension four or greater, there is a compact Kaehler manifold which is not homotopy equivalent to a projective one. For dimension at least six, she gives examples which are also simply connected. A later result gives a substantial strengthening: in any even dimension ten or greater, there exist compact Kaehler manifolds, no bimeromorphic model of which is homotopy equivalent to a projective algebraic variety. Distinguishing the homotopy type of projective and non-projective Kaehler manifolds is achieved through novel Hodge-theoretic arguments that place subtle restrictions on the topological intersection ring of a projective manifold. For his work on rational billiards and geometric group theory, in particular, his crucial contribution to joint work with David Fisher and Kevin Whyte establishing the quasi-isometric rigidity of sol. For their work in advancing our understanding of the birational geometry of algebraic varieties in dimension greater than three, in particular, for their inductive proof of the existence of flips. For their work on local and global Galois representations, partly in collaboration with Clozel and Shepherd-Barron, culminating in the solution of the Sato-Tate conjecture for elliptic curves with non-integral j-invariants. CMI recognizes Manjul Bhargava for his discovery of new composition laws for quadratic forms, and for his work on the average size of ideal class groups. The field of composition laws had lain dormant for 200 years since the pioneering work of C.F Gauss. The laws discovered by Bhargava were a complete surprise, and led him to another major breakthrough, namely, counting the number of quartic and quintic number fields with given discriminant. The ideal class group is an object of fundamental importance in number theory. Nonetheless, despite some conjectures of Cohen and Lenstra about this problem, there was not a single proven case before Bhargava's work. Bhargava solved the problem for the 2-part of the class groups of cubic fields, in which case, curiously, the numerical evidence had led people to doubt the Cohen-Lenstra heuristics. CMI recognizes Nils Dencker for his complete resolution of a conjecture made by F. Treves and L. Nirenberg in 1970. This conjecture posits an essentially geometric necessary and suffcient condition, "Psi", for a pseudo-differential operator of principal type to be locally solvable, i.e., for the equation Pu = f to have local solutions given a finite number of conditions on f. Dencker's work provides a full mathematical understanding of the surprising discovery by Hans Lewy in 1957 that there exists a linear partial differential operator -- a one-term, third-order perturbation of the Cauchy-Riemann operator -- which is not locally solvable in this sense. The necessity of condition "Psi" was shown for operators in dimension 2 by R. Moyer in 1978 and in general by L. Hormander in 1981. The sufficiency of the condition has resisted many previous attacks. Ben Green was recognized for his joint work with Terry Tao on arithmetic progressions of prime numbers. These are equally spaced sequences of primes such as 31, 37, 43 or 13, 43, 73, 103. Results in the area go back to the work of Lagrange and Waring in the 1770's. A major breakthrough came in 1939 when the Dutch mathematician Johannes van der Corput showed that there are an infinite number of three-term arithmetic progressions of primes. Green and Tao showed that for any n, there are infinitely many n-term progressions of primes. Their proof, which relies on results of Szemerédi (1975) and Goldston and Yildirim (2003), uses ideas from combinatorics, ergodic theory, and the theory of pseudorandom numbers. The Green-Tao result is a major advance in our understanding of the primes. Laumon and Ngô were recognized for their proof of the Fundamental Lemma for unitary groups. The lemma is a conjectured identity between orbital integrals for two groups, e.g., the unitary groups U(n) and U(p)xU(q), where p+q = n. Combined with the Arthur-Selberg trace formula, it enables one to prove relations between automorphic forms on different groups and is a key step towards proving links between certain automorphic forms and Galois representations. This is one of the aims of the Langlands program, which seeks a far-reaching unification of ideas in number theory and representation theory. The result of Laumon and Ngô uses the equivariant cohomology approach introduced by Goresky, Kottwitz, and MacPherson, who proved the lemma in the split and equal valuation case. The proof for the unitary case, which is significant for applications, requires many new ideas, including Laumon's deformation strategy and Ngô's purity result which is based on a geometric interpretation of the endoscopy theory of Langlands and Kottwitz in terms of the Hitchin fibration. For his discovery of the Ricci Flow Equation and its development into one of the most powerful tools of geometric analysis. Hamilton conceived of his work as a way to approach both the Poincaré Conjecture and the Thurston Geometrization Conjecture; presented on November 14, 2003 in Cambridge, MA. For his ground-breaking work in analysis, notably his optimal restriction theorems in Fourier analysis, his work on the wave map equation (the hyperbolic analogue of the harmonic map equation), his global existence theorems for KdV type equations, as well as significant work in quite distant areas of mathematics, such as his solution with Allen Knutson of Horn's conjecture, a fundamental problem about hermitian matrices that goes back to questions posed by Hermann Weyl in 1912; presented on November 14, 2003 in Cambridge, MA. For his work in combining analytic power with geometric insight in the field of random walks, percolation, and probability theory in general, especially for formulating stochastic Loewner evolution. His work opens new doors and reinvigorates research in these fields; presented on October 30, 2002 in Cambridge, MA. For finding, jointly with two undergraduate students, an algorithm that solves a modern version of a problem going back to the ancient Chinese and Greeks about how one can determine whether a number is prime in a time that increases polynomially with the size of the number; presented on October 30, 2002 in Cambridge, MA. For a lifetime of achievement, especially for pointing the way to unify apparently disparate fields of mathematics and to discover their elegant simplicity through links with the physical world, presented on July 13, 2001 in Washington, DC. For establishing the existence of the scaling limit of two-dimensional percolation, and for verifying John Cardy's conjectured relation, presented on July 13, 2001 in Washington, DC. For revolutionizing the field of operator algebras, for inventing modern non-commutative geometry, and for discovering that these ideas appear everywhere, including the foundations of theoretical physics; presented on May 24, 2000 in Paris, France. For his role in the development of number theory, presented on May 10, 1999 in Cambridge, MA.